A trip to the magnificent German city of Cologne which spans the impressive River Rhine and is famed for being the cultural hub in Western Germany. A landmark of High Gothic architecture set amid a reconstructed old town, the twin-spired Cologne Cathedral is also known for its gilded medieval reliquary and sweeping river views. The adjacent Museum Ludwig showcases 20th century art, including many masterpieces by Picasso, and the Romano-Germanic Museum houses Roman antiqities. 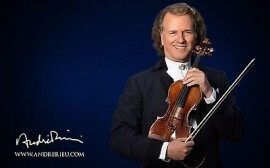 The highlight of this trip is a concert held by world reknowned musician Andre Rieu. With top price category one tickets in the indoor Lanxess Arena, this promises to be an unforgettable experience. Price is per person on half board basis and includes category 1 concert ticket. DAY 2 – Free time to explore the beautiful city of Cologne perhaps enjoying a stroll along the Rhine Pier or a walk through the numerous shopping streets. 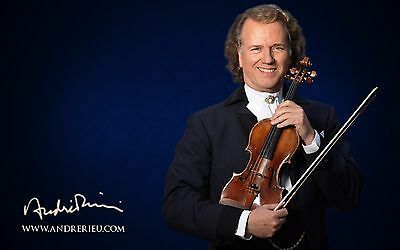 Following an early dinner, we depart for the highlight of the tour and travel to the impressive Lanxess Arena for the spectacle of Andre Rieu in concert. A truly memorable evening. DAY 3 – After breakfast we take a guided tour of the wonderful city centre of Cologne where we see the many sights on offer including the hugely imposing twin spired Gothic cathedral. In the afternoon we visit a chocolate museum which includes a guided tour and a chance to taste at the chocolate fountain before we return to the hotel for your evening meal. DAY 4 – Following breakfast we depart Cologne for our journey back to England via Eurotunnel from Calais. Our Hotel – At the time of going to press, our hotel had yet to be confirmed. However the hotel will be modern and based in the Cologne area and will be a minimum of 4 stars.